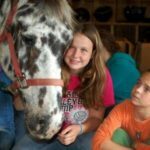 Camp Ondessonk | Camp Ondessonk's Adopt a Horse program is a great way to make a difference in the lives of thousands of Camp Ondessonk campers. Camp Ondessonk’s Adopt a Horse program is a great way to make a difference in the lives of thousands of Camp Ondessonk campers. For the adoption fee, adopters provide for food, veterinary care, equipment maintenance and replacement, and other needs for the horse of their choice. Since 1959, the Camp Ondessonk Equestrian Program has served over 100,000 children and kids-at heart who have been introduced to the wonderful world of horsemanship. Unlike many camps, horseback riding has always been included in our summer camps at no extra charge. Our campers cherish the memories and experiences provided by our beloved herd of 75+ horses, and our enthusiastic, dedicated riding instructors. Most of all, Camp Ondessonk is blessed to have many volunteers who have given their time, talent and treasure to build our excellent CHA-accredited program. Eats more than $100 of feed and hay in a year? Requires $175 in vet care to stay healthy and prevent diseases such as the deadlyWest Nile virus? Needs equipment (saddles, blankets, bridles) that requires routine maintenance and replacement? Must have routine hoof care that costs at least $50 a year? In today’s world, the price of excellence is skyrocketing. We grow much of our herd’s hay, but our program incurs many other costs that quickly add up. Camp Ondessonk is growing, and we want to build on the success of our 50-year-old showcase Equestrian Program. Adoptions are renewed yearly. Please join our Supporters! Download an Adopt a Horse Brochure to see pictures of our herd!